News and updates about the first zero-energy shared-ownership rental cabin. It seems that a dual-flush toilet would be the right choice for an eco-friendly house, but this single-flush Toto toilet changed my mind. Alex, Leon, and I were lucky enough to spend the month of June at Artemisia, en route to Madison, Wisconsin, where we are moving. It was great to be able to settle in for a while and enjoy the spectacular Methow Valley and our zero-energy cabin. We've been busy putting the finishing touches on our zero-energy cabin, and we're really happy with how it's turned out. Compared to the "big show" of the walls and interior framing going up, this final phase of finish work seemed like it went very slowly. After getting bumped from our first tiler's schedule, Sy came up from Chelan to install our backsplash and shower pan. We ran into some issues with the porcelain tile we originally chose for the kitchen. Our electrical outlets were placed too close to the top of the backsplash, and the tiles Sy tried to cut kept breaking. The New Year has come and gone, and Artemisia is still under construction. But we're getting closer to reaching the finish line and starting to enjoy our zero-energy shared home. The house is feeling much brighter and more spacious on the inside now that it has been painted. Our drywall installer sprayed on a very light orange-peel texture and then two coats of zero-VOC paint. We chose to pay a slight premium for this premium paint to avoid the odors and off-gassing of traditional paints. Alex and I have been going to the Methow Valley for years. We've enjoyed skiing in the winter with family, camping with friends in the summer, running the Sunflower Relay marathon, and sampling tasty baked goods from the Mazama Country Store. Like so many people, we were attracted to the area's stunning beauty and ample opportunities for outdoor recreation. Receive occasional news about Artemisia, the first zero-energy shared-ownership rental cabin. 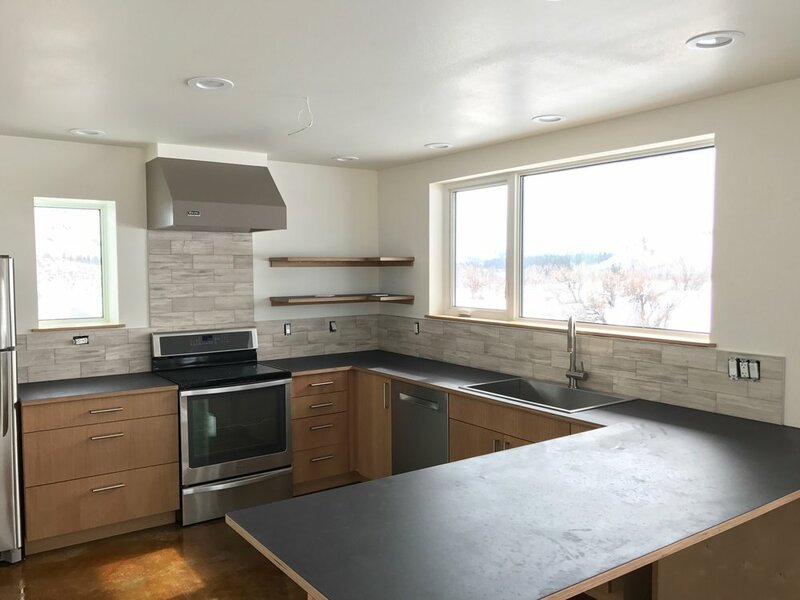 We are a group of outdoor enthusiasts who built a highly efficient home base for nordic skiing, climbing, hiking, and relaxation under the stars. Artemisia is a net-zero-energy solar-powered house with two bedrooms and a loft. It is constructed of structural insulated panels (SIPs) that afford the high degree of insulation and air tightness needed to meet our net-zero goal. Glazing is triple pane, and the house and windows are situated to maximize solar heat gain in the winter and shade in the summer. The home is 100% net-metered solar electric, with no gas, wood, or other fuel sources. We worked with an architect to come up with a design that will blend well with the natural surroundings, and we have tried to choose contractors who have experience minimizing soil disturbance during construction. Eric is marketing manager for CRD Design Build, a residential remodeling company based in Seattle's Fremont neighborhood. He is former co-organizer of Seattle's NW Green Home Tour and the annual EcoBuilding Conference. Alexandra is a supervisor at the Fred Hutchinson Cancer Research Center, where she helps manage a cancer information and smoking cessation service. Eric and Alex built Seattle's first net-zero-energy home. Dave is a founding partner of 360 Analytics, a building energy analysis consultancy, whose services include modeling to support compliance with green building standards, such as LEED and Built Green. Lisa manages Snohomish County's Office of Energy & Sustainability, which works to conserve natural resources, reduce climate impact, and facilitate environmental stewardship. Quite simply, this means that Artemisia's solar panels will produce as much electricity over the course of a year as is used for heating, cooking, lighting, and other household tasks. As the first net-zero-energy nightly rental house, Artemisia is an ideal test bed for new and innovative green building materials and techniques. We are seeking a limited number of products for testing and review. If you are a vendor or service provider in the green building/net-zero-energy sphere, please contact us or download the prospectus.